The dial is black or silver-plated. Hours and minutes hands are located in the center. The seconds hand is at 9 o’clock. Added to this inherently traditional layout is an unobtrusive yet original power reserve display. With a centrally positioned hand, this new complication, wholly designed, developed and manufactured by Maurice Lacroix, lies at the outer edge of the dial. 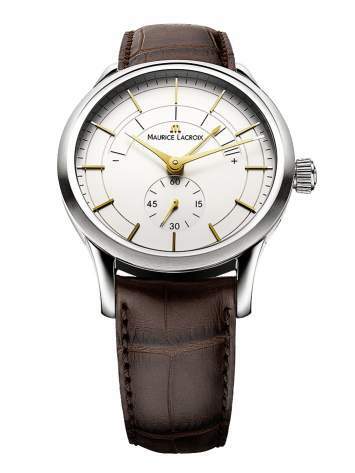 The Les Classiques Réserve de Marche timepiece conceals an ML 109 caliber, featuring an extra component to operate the power reserve that propels it straight into the halls of the great. The plain, stark design highlights the distinctiveness of this complication. Its single, delicately sand-blasted hand contrasts with the luminescent hour and minute hands, to better highlight the innovative character of the power reserve. An understated whole, the watch’s exquisite visual harmony marks it out unmistakably. The 40 mm-diameter stainless steel case, water-resistant to 30 meters, captures the light in a natural, unaffected way. And yet, it makes an excellent showcase for an original horological complication. ■ Complication module created, developed and manufactured by Maurice Lacroix.